While we wait for biopic Mao’s Last Dancer to hit UK screens and for Carlos Acosta’s own No Way Home to be filmed, documentary Only When I Dance (Vida Ballet), screened at the Barbican’s Brazilian Film Festival last October, provides a present-day look at the challenges faced by impoverished aspiring young dancers, this time in the context of escaping the harsh environment of the Brazilian favelas. Having missed it on the big screen due to the Mayerling madness which hit The Ballet Bag for several weeks in the autumn I was glad for the opportunity to catch this gripping, poignant tale on UK TV (Channel 4) during the Christmas holidays. Only When I Dance follows two Brazilian ballet students, Irlan dos Santos Silva and Isabella Coracy. Both hail from favelas in the outskirts of Rio de Janeiro, definitely not your usual ballet dancer breeding ground. Thanks to scholarships and the foresight of headteacher Mariza Estrella (who won the “OUTSTANDING TEACHER AWARD” at Youth America Grand Prix in 2008) they are students in the same school where Royal Ballet Principal dancer Thiago Soares trained. For the perfectly proportioned Irlan, one of the school’s most remarkable students, dreams of a professional career in ballet do not seem unattainable: as long as he passes school exams and continues to work hard, the chips might fall in the right places, especially if he manages to win a Prix de Lausanne scholarship. Of course nothing ever comes easy in the world of ballet but Irlan’s road seems much less bumpy than hard-working Isabella’s. Black, curvy and extremely graceful yet-no-virtuoso, her odds of securing a contract with a major ballet company are less favourable and she is well aware of this. While Irlan appears more confident about future options, she timidly says to the camera that her dream is “to perhaps dance in a classical ballet company”. Director Beadie Finzi’s initial idea was to follow Irlan’s story exclusively but she was persuaded by Ms. Estrella that Isabella’s tale would make for an interesting contrast. This clever headteacher probably saw a chance to raise awareness to Isabella’s plight, a cause which seems very dear to her heart. During discussions and counselling with the Coracy family we see a realistic and yet encouraging Ms. Estrella as she hopes to see Isabella fight back and overcome professional obstacles. We also see Isabella’s supportive family struggle to arrange funds so that she can travel to YAGP where she hopes to win an award. From tears and the threat of injury to hope and back to tears, her story is what really makes the movie such an honest, riveting tale of holding on to your dreams. As her father Toti says “victory comes easy for those born rich, but the rest of us have to fight”. It is heartwarming to see Irlan achieve his dream of trading the dangerous grounds of the favela for a “better and calmer place” but a pity that the movie focuses so much of its final moments on his success (he is hired by ABT2) while neglecting to dwell on what might become of Isabella. Thanks to this article from The Times we discover she has secured a contract with a well known local ballet company and that she too is about to make her dreams come true. As we prepare to send off 2009 and embrace a new decade, we look back into what was hot, fun & fab around the ballet blogosphere to pick our favorite things this year. Feel free to share yours too. The coolest ballet campaign of the year. We keep on crossing our fingers & sending positive vibes for Mayerling to be part of ABT’s repertory someday. We’d definitely cross the Atlantic to see Marcelo Gomes as Crown Prince Rudolf. We love uncovering mysteries à la Sherlock Holmes / Dr. Gregory House. Divalicious prima ballerina decides she doesn’t like the score for her Swan Lake 3rd Act solo and asks Ludwig Minkus to write another one. This in turn bothers the original composer, a certain Mr. Tchaikovsky, who then writes a second version which never makes it to the final cut after all. Complicated? This could very well yield material for a soap opera. While Eurostar #FAIL would have surely prevented us from celebrating a balletic Xmas in Paris this year, this post provided us a much needed insight into the pick and mix of POB‘s casting. We are very curious about the darkest of all Nutcrackers and we might be more than tempted next December when the Mariinsky will also be in town. The post also offers a witty description of a certain Bolshoi star who has a habit of hanging on to theatre curtains. We love graphic novels, comic books and movie adaptations of both. We also often imagine deathmatches between our favorite ballet stars… if only we could pitch this idea to MTV. In this very funny post Eric Taub imagines Ballet dancers as drawn by famous comic book artists. She is one of the most glamorous things to have happened to ballet. Just as gossip started to circulate that she would leave ABT she turned the tables on the rumour mill and bagged a promotion for Principal and a spot on David Letterman. May she long continue to fascinate us. Sanjoy Roy on How dance companies must embrace the internet. The Guardian dance writer Sanjoy Roy picks up on the Ketinoa debate. Interviews – Three fabulous leading dancers with each of the Mariinsky, the Royal Ballet and ABT. Three very distinct personalities which resulted in very different interviews. We hope you enjoyed them as much as we did. We are crossing our fingers for more. Bridge Over Troubled Water & other Social media posts – We are big believers in the power of social media. All of these posts were great fun to write & some even managed to stir some controversy (see Sanjoy Roy article above). Supermassive Black Hole – Our resident physicist analysed BRB’s new ballet based on Einstein’s Theory of Relativity. Perfect for the job. Grace – This was a tough cookie. Someone asked in our Facebook group if we could write something about the ballerina’s grace. It was hard to put a subjective concept into words but we really liked the final product, not least because it gave us a chance to quote from Pride and Prejudice. We know we had a lucky year with many wonderful ballet tickets filling our bags. We had a great time writing over here and making plenty of new friends on Twitter and Facebook some of whom we had the pleasure of meeting in person. Having managed to strike a good balance between work & play we feel we now deserve some ballet candy for the new year. We’d happily trade that wonderful Rodarte dress or that anything Chanel we have coveted over the years for a few of these treats so, here’s what the Bag Ladies would really really like. Please and thank you. More NYCB, ABT and Mariinsky stars guesting with the Royal Ballet. If Evgenia Obraztsova, Ekaterina Osmolkina and Yvonne Borree did so well over here in The Sleeping Beauty, Swan Lake and Dances at a Gathering why can’t we have them more often and while you’re at it, can you please bring Ashley Bouder and Marcelo Gomes too? Royal Ballet revivals of Onegin, Song of the Earth and La Sylphide with plenty of new casting delights… and preferably with Steven McRae as James. Much smaller doses of such stalwarts as The Sleeping Beauty and Swan Lake or at least new designs for the latter. Yolanda Sonnabend’s are appreciated but they are starting to betray their age. If we are going to visit the lake once more let us see some different settings and costumes. A new narrative ballet that is not based on a children’s tale. Don’t get us wrong, it’s not that we are not looking forward to Wheeldon’s Alice in Wonderland, but a while back we had this interesting discussion on Twitter and concluded there are so many books which would lend themselves wonderfully into ballet scripts. We’re thinking the whole Jane Austen canon, the Russian classics, plus some Edith Wharton & Henry James. Sneak previews. If ballet seasons are planned so long in advance, we’d like to see the major ballet companies slipping some bits of information/trivia/teasers on what’s coming next or fueling discussion in their Facebook/Twitter pages like ABT did recently. Call us greedy but it’s more hype for them, less suspense for us. Everyone wins. More visits from foreign companies. It’s time the Mariinsky treated us to a full-length Ratmansky ballet (yes we do mean The Little Humpbacked Horse). ABT could follow suit and show us On the Dnieper instead of Le Corsaire and Don Q. (yawn, yawn). And let us not forget that Ms. Diana Vishneva still owes us a visit since pulling out of the Mariinsky season at Sadler’s Wells (2008) at short notice. Can you pls. give her the nudge? Can we have more ballet companies embracing social media? We have great fun browsing SFB’s blog, ABT’s pictures and looking at NYCB, Mariinsky and Royal Ballet videos, but perhaps the Paris Opera Ballet and the Bolshoi can also follow suit? Less injuries. This we wish for every dancer in every company out there. Many thanks again. Don’t forget to grab your box of cupcakes from underneath the Christmas tree. We know how you like the Christmas pudding special from The Primrose Bakery. Is this ballet for you? Go if: For the past few years you have overdosed on too many Nutcrackers and would like to see something different. You are dreaming of a White Christmas, sleigh bells in the snow, etc. 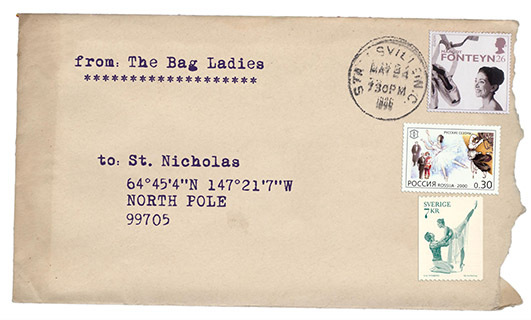 Skip if: Cute and/or nostalgic Edwardian Christmases are not your thing. British ballet owes a huge debt to Sir Frederick Ashton, one of its most important choreographers and a big advocate of classical tradition. Ashton was born in Ecuador in 1904 and grew up in Peru where his father was in the diplomatic service. He became spellbound by classical ballet after seeing Anna Pavlova on tour in 1917. Upon arriving in Britain he started training as a dancer but shortly thereafter, encouraged by Marie Rambert, he turned to choreography. Despite his late start Ashton’s professional aspirations in dance led him to admire and embrace classical tradition in ballet. He once opined: “The idea so often expressed that classical technique is hampering to artistic expression is erroneous and misleading”. Upholding the Petipa heritage he developed his own style, which combined academically unorthodox movements with classical ballet, and created a vast repertoire for the budding British ballet company which would soon become The Royal Ballet. Ashton was Balanchine‘s contemporary but while Mr. B – another classicist who admired the beauty of dance – opted for abstration and minimalism Ashton approached it from a different perspective. Rather than reduce ballet to bare essentials he tried to convey warm feelings and an idealised image of the world, often focusing on narrative. All of these qualities are evident in Les Patineurs, one of his earlier works. In Les Patineurs we can see Ashton’s beautiful world at play: scenes commonly found in an ice-rink over Christmas season, with couples romantically skating hand in hand, the bravura teen dazzling the crowd with his daredevilish spins, beginners clinging onto whatever is in front of them to avoid the humiliation of falling on ice. All of these moments are wrapped up in gorgeous 1930’s scenery and Edwardian fur-trimmed outfits. The inspiration for Les Patineurs came from composer Constant Lambert. Lambert admired Giacomo Meyerbeer‘s opera Le Prophète which featured a short comic relief sequence with dancers on roller skates. He reorchestrated the piece and showed it to Ashton who set to choreograph a new ballet which preserved the lighthearted nature of the original work. The result was a 27-minute long plotless yet accessible ballet, with choreography that makes the dancers look like they are ice skating and scenes familiar to anyone who has ever been to an ice rink. It is an ideal work for first timers and balletomanes alike, especially for those keen on observing early Ashton. The ballet demands a supple upper body to cope with the fluidity of movement combined with fast footwork for the lower body. The result should look easy and simple, even if the movement’s fundamentals are demanding, as in the duet for the two Red Girls. Les Patineurs follows a classical structure of divertissements, virtuoso variation, a central pas de deux and ensemble pieces that form a complete whole. Each character has a specific role with various social interactions taking place at the ice rink, with an overall mood of sophistication, enchantment and wonder. Les Patineurs has been staged by many ballet companies and grew extremely popular in the US where it was performed by American Ballet Theatre and The Joffrey, both versions having been telecast in the 70’s. ABT’s production boasted designs by the great Cecil Beaton, with forest green instead of blue for the virtuoso soloist’s costume. More recently, it has been added to Sarasota Ballet’s repertoire. The music for Les Patineurs was arranged by Constant Lambert who orchestrated different selections from Meyerbeer’s Le Prophete together with the aria “Bel Cavalier” from L’Etoile du Nord. Music: Giacomo Meyerbeer (selections from the operas Le Prophete and L’Etoile du nord). Arranged and orchestrated by Constant Lambert. Original Premiere: 16 February 1937. Vic-Wells Ballet, Sadler’s Wells Theatre, London. Original Cast: Mary Honer, Elizabeth Miller, Harold Turner, Margot Fonteyn, Robert Helpmann, Pamela May, June Brae. Frederick Ashton by John Percival. ROH Programme Notes for Les Patineurs/Tales of Beatrix Potter, December 2007. Go if: you want to treat your kids, godchildren, nieces and nephews or even perhaps the kid in you. The Nutcracker is a major example of a balletic twist of fate. The very thing critics and audiences objected to at the time of its premiere 117 years ago – its appeal to children – is what turned it into such a bankable classic. From your local end of the year ballet school presentation to the most lavish productions for the big companies and every kind of thing in-between (even Nutcracker on Ice), Christmas season has now become saturated with Nutcrackers everywhere. Ivan Vsevolozhsky, the same Imperial Theatre Director who had brought together Tchaikovsky and Petipa for his ambitious project The Sleeping Beauty had imagined a new ballet to be based on the book L’Histoire d’un Casse Noisette by Alexandre Dumas père. This was a story he knew from his time in Paris as a diplomat and which Dumas himself had adapted from Ernst Theodor Amadeus (E.T.A.) Hoffmann‘s Nussknacker und Mausekönig (The Nutcracker and the Mouse King) from 1816. Vsevolozhsky managed to secure Tchaikovsky and Petipa’s collaboration again but Tchaikovsky only agreed to write for The Nutcracker on the basis that he would also be able to work on his opera Iolanta. Because Petipa had fallen ill he ended up working mostly with the choreographer’s assistant Lev Ivanov. Although Tchaikovsky’s music was appreciated (but again thought too symphonic for a ballet) the production was criticized, mainly for the lack of logic relationship between its two acts. The Nutcracker received only 14 performances initially. Some critics thought there was not enough complexity in the story and “no subject whatever”. To critics and audiences alike, the Nutcracker was a luxurious piece but one that was “made for children”. Although it was not considered much of a hit in Russia The Nutcracker kept being performed throughout the theatre year (at that time it was not yet heavily associated with the Christmas season). In the West, however, it boomed. First seen in scattered pieces, with the Arabian dance transplanted into the Ballets Russes’s Sleeping Princess and with Anna Pavlova‘s take on The Waltz of the Snowflakes, London audiences soon got the first full version. Most versions have some links back to the original but by the time they were staged much of the choreography had been lost and/or changed. This meant that Ivanov’s original Waltz of the Snowflakes had to be reconstructed from notations (presumably incomplete) made in St. Petersburg before WWI. Likewise, Ivanov’s Grand Pas De Deux in which Prince Coqueluche (Koklush) spread out a veil gently gliding the Sugar Plum Fairy as if she were on ice (or icing sugar) has been revised or scrapped in most versions although Balanchine’s Nutcracker still pays homage to it. Perhaps the biggest downside to so many different Nutcracker versions over the years has been the progressive watering down of E.T.A Hoffmann’s original story and its aura of mystery, rooted in the German Romantic movement. Hoffmann’s tales often include fantastic elements coexisting with folklore (another example being Coppélia) which are sometimes ignored in favour of the ballet’s child friendly aspects. However, some versions of the ballet seek to preserve the Romantic layers and its mystery, notably Nureyev’s version for the Paris Opera Ballet (POB) as well as Sir Peter Wright‘s for The Royal Ballet and for Birmingham Royal Ballet. The first complete Nutcracker was staged in London by the Vic-Wells Ballet in 1934, based on choreographic notation by Nicholas Sergeyev. Ten years later saw the first US version by San Francisco Ballet (1944) and another ten years brought George Balanchine’s blockbusting version for NYCB (1954), now staged every year by several US ballet companies. By the 1980s, 300 separate productions were touring the US. Sir Peter’s 1984 version of The Nutcracker for The Royal Ballet, still performed by the Company, stays close to Hoffmann’s original tale. It emphasises Drosselmeyer’s mission to find a young girl – Clara – who can break the curse imposed by the Mouse King on his nephew Hans Peter and thus restore him to human form. References to Nuremberg and German Christmas traditions are present in the settings, with a kingdom of marzipan featured in Act 2. Equally successful is his 1990 version for The Birmingham Royal Ballet, this one closer to the Russian tradition of having Clara double up as the Sugar Plum Fairy, but with a slight twist: it is Clara’s alter ego ballerina doll who turns into the Fairy. Nureyev’s production for POB has a clear emphasis on symbology and the subconscious: Clara wanders down the stairs at midnight to find her family and friends turned into rats and bats while Drosselmeyer transforms into a handsome prince. Mikhail Baryshnikov‘s 1976 popular version for ABT turns the Christmas dream into a coming-of-age tale. There is no Sugar Plum Fairy nor Prince Koklush, the focus being Clara’s encounter with the Nutcracker Prince as orchestrated by her Godfather Drosselmeyer. As the ballet ends so does Clara’s fantasy. More recently the ballet has seen a flurry of ironic takes. In Mark Morris’s The Hard Nut (1991) the Stahlbaums are a suburban family with a fake Christmas tree, bad hairdos and too much to drink, the second act Arabian divertissement being a trio for oil sheiks. In Matthew Bourne‘s Nutcracker! (1992) Clara lives in an orphanage run by Mr. and Mrs. Dross and tries to win the heart of the hunky Nutcracker prince. A Christmas party is taking place at the Stahlbaums’, parents to Clara and Fritz. Drosselmeyer brings his goddaughter Clara a gift of a nutcracker doll. Children being children, Fritz eventually grabs and breaks the Nutcracker doll much to Clara’s dismay. Drosselmeyer fixes it restoring peace amongst the youngsters. Guests depart and Clara suddently sees herself surrounded by a fantasy world, where the Christmas tree grows giant and dolls and soldiers come to life to battle with the mice who have also grown to Clara’s own size. She sees her Nutcracker doll leading the battle and being attacked by the Mouse King. She throws her slipper at the Mouse, liberating the Nutcracker who turns into a Prince. They embark on a magical journey, their first stop being the Land of Snow where snow flakes waltz around them in patterns, as if blown by the wind. Clara and her Nutcraker Prince arrive at the Kingdom of Sweets where they are greeted by the Sugar Plum Fairy and her Prince Cavalier. They are invited to watch a series of divertissements representing exotic travels and various different sweets: Chocolate (Spanish dance) Coffee (Arabian dance) Tea (Chinese dance), the Russian Trépak (Cossacks), Mother Ginger & the polichinelles (in certain versions), along with the dance of the little pipes/Mirlitons and the Waltz of the Flowers. The celebrations close with the Sugar Plum Fairy and her Prince dancing a grand pas de deux. The curtain usually falls on Clara waking up back at home wondering whether it was all just a dream. Tchaikovsky died in 1893 not knowing what a big success his work would achieve. He had been burned twice before writing for ballet (with Swan Lake and The Sleeping Beauty) so he was less than enthusiastic to do so again but Vsevolozhsky convinced him on the basis that he would also be able to write the opera Iolanta which interested him more and which premiered on the same day as the ballet. Paradoxically, his Nutcracker score became, over the years, the more celebrated of the two works. Having received the joint commission, Tchaikovsky started on The Nutcracker writing to his brother Anatoly in March 1891 that “the main thing is to get rid of the ballet; as to the opera I am so fascinated by it that if I could have two weeks of peace I would be sure to finish it on schedule”. As he embarked on a trip to Berlin and Paris en route to an American tour that same year he heard of the death of his sister Sasha. Perhaps for this reason a hint of sadness and nostalgia permeates The Nutcracker‘s haunting score. He finished composing the ballet on 6 July 1891 having added to it a novelty instrument which he had bought during his tour in Paris, the celesta, which he used to give The Sugar Plum Fairy her characteristic sound of heavenly bells. Original Cast: Antoinetta dell’Era as the Sugar Plum Fairy, Pavel Gerd as Prince “Koklush” (also known as Prince Coqueluche or Orgeat), Nikolay Legat as The Nutcraker Prince and Timofei Stukolkin as Drosselmeyer. 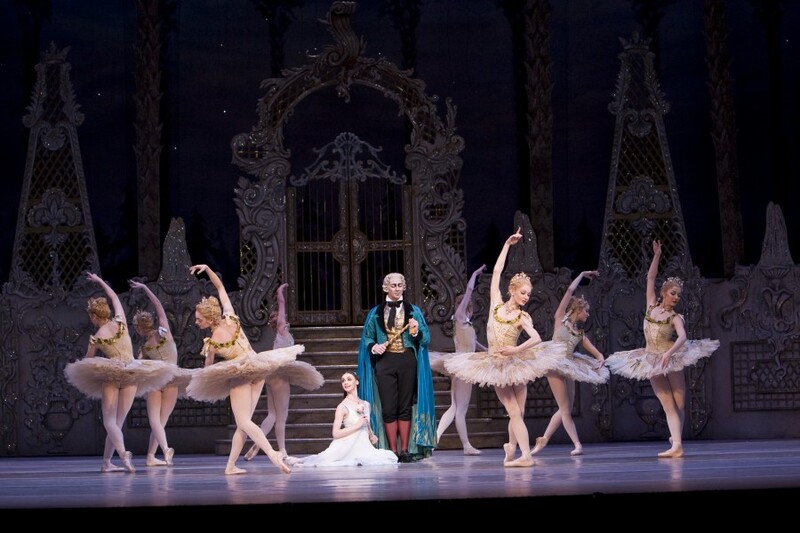 The Royal Ballet – The Nutcracker is in repertoire at the Royal Opera House from November 26 to January 1st. For booking details visit the ROH website. 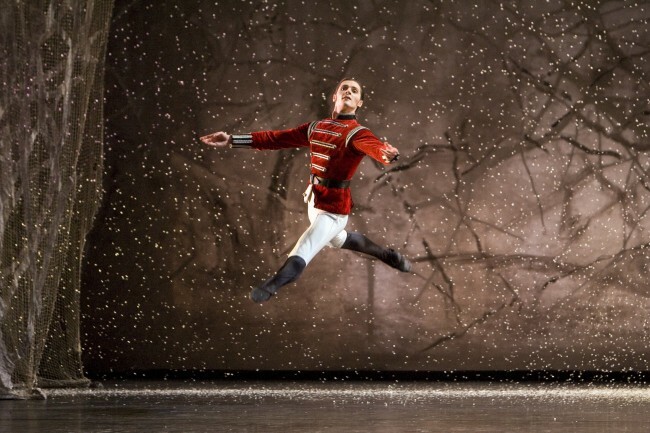 Birmingham Royal Ballet – The Nutcracker is in repertoire at the Birmingham Hippodrome from November 27 to December 13. For booking details visit The Birmingham Hippodrome’s website. English National Ballet – The Nutcracker, with choreography by Christopher Hampson, is in repertoire at the London Coliseum from December 16 to January 3. For booking details visit the ENO website. The Royal Ballet’s Nutcracker Programme Notes. As long as there are choreographers like Alexei Ratmansky around our hopes for the future of classical ballet as an art form are renewed. Now one of the world’s most sought-after choreographers, Ratmansky started his career as a ballet dancer with the Kiev Ballet in the Ukraine. Dancing soon took him out of Eastern Europe to various companies in the West where he was exposed to different choreographers and styles. Absorbing all these influences he started developing his own choreographic language, a personal mix of influences by Petipa, Bournonville, Ashton, Balanchine and Tudor woven into narrative or abstract choreography. His achievements as the Bolshoi’s Artistic Director and a winning streak of new works, including those for New York City Ballet (NYCB), put him center stage. This led to his recent appointment with American Ballet Theatre (ABT) as Artist in Residence, a role tailored so that Ratmansky can create new work for ABT whilst continuing to choreograph worldwide. While we follow his ABT career with interest and keep crossing our fingers for more of Ratmansky’s work in London, we leave you with some interesting facts & web notes on him. Alexei Ratmansky was born in St. Petersburg in 1968. He grew up in Kiev, Ukraine where his father – a former gymnast – worked as an aeronautics engineer and his mother as a psychiatrist. At the age of 10 he was accepted into the Bolshoi Academy (Moscow Choreographic Institute) to train under the guidance of Pyotr Pestov and Anna Markeyeva. His classmates included former ABT star and current Berlin Staatsballett Artistic Director Vladimir Malakhov, current Bolshoi director Yuri Burlaka and Bolshoi star Nikolai Tsiskaridze. From early on Ratmansky showed an interest in experimenting with choreography but despite his talents in performing and in creating dances he was not accepted into the Bolshoi. Instead, he joined the Kiev Ballet as a soloist, dancing leading roles in the classics. During this period he met his soon to be wife, fellow dancer Tatiana Kilivniuk and juggled his dancing career with studying at the Choreographers’ Faculty of GITIS (today, The Russian Academy of Theatre Art – RATI). There he had the opportunity to stage his first ballet, La Sylphide-88. Set to Shostakovich‘s music this was a short work given in one single performance. In 1992 while on tour in Canada, Ratmansky and his wife were invited to join the Royal Winnipeg Ballet. He continued creating small pieces, mainly for Tatiana, and became familiar with the works of Tudor, van Dantzig, Neumeier and Balanchine. He quit The Royal Winnipeg Ballet and returned to Kiev in 1995 as a freelance dancer but left again to join The Royal Danish Ballet in 1997. During his seven years in Denmark, Ratmansky immersed himself in August Bournonville’s works. There he continued to create choreography whilst also becoming a principal dancer (2000). Nina Ananiashvili soon spotted his talent and asked him to create short works for her international tours (the Golden Mask Winner Dreams of Japan, set to taiko drumming and flutes). The touring of these works boosted Ratmansky’s profile and led to his first commissions by the Mariinsky Theatre and the Bolshoi. In 2002, he staged Cinderella for the Mariinsky and, in 2003, The Bright Stream, for the Bolshoi, as part of their Shostakovich celebrations. The Bright Stream had been originally created in 1935 by Fyodor Lopukhov to Shostakovich’s music but immediately discarded given Stalin‘s disapproval of “peasants on pointe”. Because of this Lopukhov was fired and Shostakovich never wrote a ballet score again. Reinventing the choreography on top of the original libretto, Ratmansky turned this “rejected ballet” into a great success. Golden Mask Prize winner The Bright Stream led to Ratmansky’s appointment as the Bolshoi’s Artistic Director in 2004. His mandate was to focus on modernising the company and reconciling the new repertoire with the classics. The Bolshoi’s five years under Ratmansky have been celebrated as a golden age. The company rejuvenated and regained artistic credibility with new works. For Ratmansky it must have been a draining period with a lot of compromising and pacifying different personalities and artistic egos, leaving him with little time and energy to choreograph. He has said in the past that Russia is not very friendly to choreographers given its emphasis on the classics and inherited traditions, with certains dancers limiting themselves to new opportunities and holding on to the belief that they can only be creative within the boundaries of the old repertoire. During Ratmansky’s tenure 25 new ballets were acquired for the company including works by Balanchine, Roland Petit, Twyla Tharp and Léonide Massine. In addition to The Bright Stream he also successfully restaged lost ballets such as Class Concert, The Flames of Paris and a lavish and critically acclaimed reconstruction of Le Corsaire. In addition to developing dances Ratmansky is also credited with nurturing and creating opportunitities for such new talents as Natalia Osipova, Ivan Vasiliev, Ekaterina Krysanova, Nelli Kobakhidze and Denis Savin, while also showcasing the artistry of dancers Maria Alexandrova, Ekaterina Shipulina and Svetlana Lunkina, by casting them in new roles. Early in 2008, rumours started circulating of Ratmansky departing to NYCB as resident choreographer, to follow in the steps of Christopher Wheeldon. But the terms of NYCB’s offer would have restricted his ability to create work outside the company so, instead, he decided to join ABT as an Artist in Residence, a role that gives him enough freedom to pursue other collaborations. For Ratmansky, classical ballet can be kept alive as long as its human content is relevant, narrative being a particular trait in his works. Ratmansky often mentions that while for George Balanchine, one of his influences, it was all about the steps and abstraction, for him the steps are part of a conversation that blends craft and passion. His works are considered musical and fluid, probably a direct influence from his experience with Bournonville. He considers his choreography to be instinctive, the product of an analytical reaction to the score and physical response to the music (he used to put on music and film himself to observe how his body reacted naturally). That explains his preference for a more naturalistic port de bras, open chested stands, patterns that are circling, dynamic and constantly shifting, with suggestions of folk dance, as is the case with his Russian Seasons. The following short extracts should give you an idea of how rich and varied Ratmansky’s choreography is and how widespread it has become. Leaving the theater, I could have danced for joy, especially if I had been choreographed by Ratmansky. A new choreographer has come to light – and the dance world is a better place. Clive Barnes at The New York Post (2006). Freelance Freedoms. Alexei Ratmansky in conversation with Marc Haegeman. Dance Now Magazine. Vol. 17, No. 4. Winter 2008/09. If you follow dance on the internet chances are you will have heard of Daniil Simkin. He is the whiz kid (not just dance-wise but also tech-wise) who arrived last year from Vienna State Opera to stir some fresh buzz into American Ballet Theatre’s soloist ranks. His virtuoso dancing and various gala appearances, including the prestigious World Ballet Festival in Japan, have drawn a solid fanbase from every corner of the globe and Daniil draws on multi-platform social media and Web 2.0 to stay in touch and connect with all these fans. We caught up with Daniil ahead of ABT’s trip to China later this week. He was kind enough to answer our questions about his ABT repertoire, his social media projects and to share his plans for the upcoming gala evening “INTENSIO” in Athens this December. You are now in your second season with ABT. Can you tell us how it’s going? Any new roles/debuts on the horizon? Which roles do you expect to dance in the upcoming tour to China? DS: So far my second season has been great. I will be touching a lot of new ground and will be expanding my horizons during the MET’s spring season, dancing in Twyla Tharp’s Brahms Hayden Variations, the great Jerome Robbins ballet Fancy Free, in Sir Frederick Ashton’s The Dream (as Puck), probably in Paul Taylor’s Company B, in addition to dancing my current roles in our classical repertoire. I have also been understudying a few Principal roles in the classics since I have performed some of them with other companies, but I have no scheduled performances in those yet. During ABT’s tour in China I will be performing ‘Everything doesn’t happen at Once‘ by Benjamin Millepied and ‘One in Three‘ by Aszure Barton, both created for ABT and premiered during its Avery Fisher Hall season this Fall. Both pieces are extremely different, but very enjoyable to perform. I am very much looking forward to the tour, especially because it will be my first visit to China. Speaking of the Far East, can you briefly share your experiences at the World Ballet Festival in Japan this past summer? DS: The World Ballet Festival was an unbelievable experience. Just the fact that I was sharing the stage with people like Sylvie Guillem, Aurelie Dupont, Manuel Legris, Alina Cojocaru, Johan Kobborg, Marianela Nuñez, Svetlana Zakharova, Leonid Sarafanov, Tamara Rojo… It gives me goosebumps. One of the most memorable moments was probably receiving corrections & pointers from Sylvie Guillem. Luckily my first show, a full-length Don Quixote, happened at the very beginning of the festival. Not everybody was there yet so I was able to concentrate on my show without thinking too much on who might be watching in the audience! You are one of few classical dancers currently using social media to connect with your audience. How did you get into it and what are you trying to achieve in all these different platforms (Twitter, Facebook, YouTube, etc.)? DS: I have always been interested in computers and any technology-related gadgets. Some boys are drawn towards cars and motorsports, whereas as a kid I was drawn to computers, science and gadgets. I spent more time on my father’s first computers than he ever did. Then came the Internet and its ever-increasing presence in our lives. Luckily I was born in an age when everything was just starting. I was designing personal websites by myself in my spare time and once codecs for videos became more efficient I put in there videos from my competitions as downloadable clips. Then one day I saw one of my clips in somebody’s MySpace page and found out somebody else had uploaded two of my clips and was selling a DVD of it on YouTube without my permission. I was shocked. Because of that I decided to put my own videos onto YouTube, otherwise others would. I also started to use MySpace after my competition in Jackson (2006) since it was the perfect way to keep in touch with a lot of the US dancers I had met there. From there it was not a long shot to Facebook and Twitter. I was the second professional dancer to use Twitter, after San Francisco Ballet Principal and good friend Maria Kochetkova. I had fun updating my status and therefore kept doing it, until twittering was the next popular thing for pretty much every and anyone. Nowadays all of my platforms are interconnected, which means that my profile and my work can be discovered through different channels. If somebody gets to know a little bit about what I do from watching my YouTube videos, this person can then have a full picture through my Facebook page, Twitter and my personal website, which is currently in the process of being upgraded to a new, fully integrated, Web 2.0 version. With all of this, my aim is to demystify our work as ‘professional dancers’. Our profession is surrounded by clichés and prejudices from misinformed people. I am trying to show that we dancers may be a little different from everybody else, but in essence we are human beings with routines, likes and dislikes, social lives and passions like everyone else. In short, we are not so different or more special than the office worker sitting in a cubicle, we just have different workspaces. People in dance talk about the need to promote ballet more widely and yet, few actually do it. Why do you think there are so few dancers/choreographers in social media channels and have you encouraged any of your colleagues to use them? DS: To quote a twitterer “I must do something” always solves more problems than “Something must be done” (Author Unknown). In the end, we as the dance world ARE the ones who have to change, not our surroundings, the media, etc. In my opinion classical dance is not more popular because in the dance world we tend to be more conservative than innovative. We have to change our mentality and prejudices towards copyright, media, replace them with openness and transparence. Only when the majority understands that this is the key to the future, will we succeed. In my opinion protectionism in these days of Internet/Web 2.0 can be destructive. That’s my two cents. I have been encouraging some of my colleagues to participate in the Web 2.0 movement, but unlike most of the other professional fields, ballet is very physical and is very little connected to technology in its everyday routine. Therefore dancers are not as open to embracing the possibilities of technology as they could be. What do you think major ballet companies should be doing to draw new audiences and to keep engaging them? DS: The same things I mentioned before. Project more openness and a certain fearlessness in their PR. Fear is the biggest enemy of innovation and it prevents them from progressing, from opening the art form towards new audiences. It is clear to me that the artistic mission of ballet companies should be to maintain a healthy balance between proven classics and innovative work with new ballet choreographers. Basically it is guarding a basis while nurturing experimental directions, but in reality, only big scale companies have the luxury to do both these things. The smaller the company, the harder it will be – budget and quality wise – to maintain a high level of both. Which doesn’t mean it is not a goal to strive for or one that’s unreachable. Can you tell us more about the gala you are organizing in Athens this December? Why this particular location and who will be guesting? DS: After performing in the ‘Svetlana Zakharova & Friends’ gala in Athens last year I was approached and asked to organize a similar event. The Gala evening is called ‘INTENSIO – An International Ballet Gala Presented by Daniil Simkin’. ‘INTENSIO’ is a play with the words ‘intense’ and ‘intention’. It describes the evening quite well in that it is not going to be just a clean dance evening, we are trying to merge different media into a ‘mashup’ for an entertaining evening. My father is in charge of the stage design and video projections specifically designed to support the dance on stage, as some pieces will be integrated with video. It is an exciting project for me and a new approach towards the usual ‘gala’ evening you see so often. How do you see your career evolving 5 years from now, what would you like to have achieved & which roles do you aspire to dance? DS: I tend not to look too much into the future. Life experience showed me that it is healthier and better for me to enjoy the things I have now and share the beauty of life right here, right now. Having said that, dancing the Principal classical repertoire is one of my priorities in the near future and I would also love to go back to school, at least part-time or to learn remotely. Right now I am too busy and I don’t have enough time, but hopefully in the future I will be able to do that. What’s in your ballet bag? Last but not least, COOKIES to keep my bloodsugar and mood up and to give me an always needed sugar-fix! The Ballet Bag is licensed under a Creative Commons Attribution-Noncommercial-No Derivative Works 2.0 UK: England & Wales Licence.